UGH the Christmas rush got the better of me. And as I am sure you know exactly what I mean and I won't bore you with details. Is Stevie's Happy Birthday today !!!!!!!!!!!!!! She is one of the nicest people I have met in my entire life and I am so glad to have her in my life and is all due to Stampin'Up! Stevie's favourite colours surprisingly are the same as Chel's, green and brown. She does prefer a lime kinda of green and when I designed her card I kept this in mind. I had this stamp set a while now and I am glad I have finally inked it up. I knew I would love it but I didn't know I would love this much. I chose to make an easel card and I have used a colour I ever hardly use in fact I struggled to find a sheet spare it is Gable Green and it is such a glorious colour, I really love it and I have ordered a full pack the other day. I am now excited about future colour combination, is funny how we stick with our most used colours sometimes. Ok so stamp set is called Garden Greenhouse, colour combo is Gable Green , Choc Chip and Whisper White. Sentiment from the Sincere Salutation set. Stevie I hope you liked your card and I hope you had a wonderful day. Oooow another stunning card Monica and those colours are lush! Monica, the colour combo is to die for WOW. Who would have thought that they would all go together, lucky Stevie. Hope you get your Christmas cards sent off in time. OOoooohhhhhh yes it clearly does as mine came today!! Thankyou!!!!! 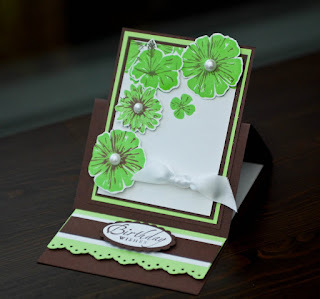 Another beautiful card Monica! TFS!!! Yes I did love it thank you so very very much monica. And the colours are just fab.